Eadweard Muybridge (1830-1904), born in Kingston-on-Thames, left England to undertake the study of photography and soon became one of the pioneers in the new field. Beginning with a series of photographic assignments for the United States government, he became well known as a landscape photographer, principally of the far West and, later, Central America. However, his studies of the human figure and animals in motion, begun in 1872, are the works by which he is mainly known today. This project, which occupied almost the entire remainder of his life, was undertaken to prove a bet — that at one time during its stride a trotting horse has all four feet off the ground (see cover photograph). His many inventions during this period of his life not only contributed to the development of photography but anticipated and laid the ground for the development of motion pictures. Almost forgotten now are other events of his life. Muybridge, having married in his early forties, discovered through letters sent to his wife, Flora, that she had a lover, Colonel Larkyns. On October 17, 1874, Muybridge sought out Colonel Larkyns at the Yellow Jacket quicksilver mines not far from San Francisco. He greeted Larkyns with the words, “Good evening Major, my name is Muybridge and here is the answer to the letter you sent my wife.” Muybridge then shot Larkyns, killing him on the spot. The subsequent trial in San Francisco was international news, Muybridge by then being quite well known. In the end he was acquitted, Larkyn’s child borne by his wife, was subsequently raised by Muybridge after his wife’s death a few years later. The Photographer, a music/theater piece, was planned as a three-part work — a play, a concert and a dance. Act I recounts the events in the life of Eadweard Muybridge relating to the murder of Colonel Larkyns and the subsequent trial. The music in Act I consists of three “incidental pieces (two of them recorded here) which fit into the play. For the first song, “A Gentleman’s Honor,” words were taken from the trial transcript, comments of spectators at the trial and letters of Muybridge to his wife Flora. Act II is presented as a concert with violin solo (played here by Paul Zukofsky) during which photographs taken by the Muybridge of the play in Act I are developed and projected on a screen at the rear of the stage. Act III brings back all the characters from Act I (Muybridge, his wife, Flora, Colonel Larkyns, et al) in a final dance. 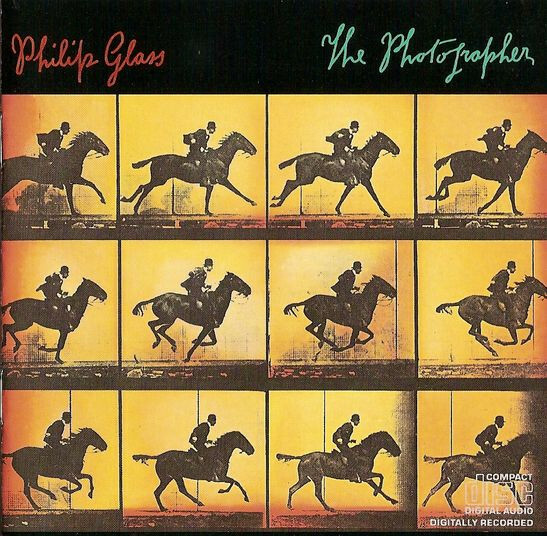 The Photographer, based on events in the life of Eadweard Muybridge, was conceived by the Dutch director/designer Rob Malasch in association with Philip Glass. It was commissioned by the 1982 Holland Festival and was performed by DeGroep with costumes by Aage Hoygaard and decor by Rein Jansma and Joost Elffers at a preview performance for Queen Beatrix and Prince Claus. The preview took place at the Royal Palace in Amsterdam, in May 1982 with Michael Riesman conducting. The work received its first public performance at the Carré Theater in Amsterdam in June 1982 as part of the Holland Festival. Music Composed and Arranged by Philip Glass. Produced by Kurt Munkacsi and Philip Glass. Conductor: Michael Riesman. Paul Zukofsky: Solo violin, Act II; Jack Kripl: Flute, soprano/alto/baritone saxophones; Michael Riesman: Keyboards, piano, bass synthesizer; Philip Glass: Electric organ. Trumpets: Lew Soloff; Ed Carroll. Trombones: Jim Pugh; Alan Raph. French horns: Bob Carlisle; Ron Sell. Strings: Marin Alsop, concertmaster; Jeanne Ingraham; Carol Pool; Lew Eley; Jill Jaffe; Maureen Gallagher; Judy Geist; Ted Israel. Chorus: Adrienne Albert; Betty Baisch, Mary Sue Berry; Rose Mane Jun; Dora Ohrenstein, lead vocal “A Gentleman’s Honor”; Maeretha Stewart; Marlene VerPlanck. Recorded and mixed at: The Greene Street Recording Studio, NY, NY. Engineers: Kurt Munkacsi, Michael Riesman. Assistant Engineer: Dan Dryden. Digital Equipment: Franck Dickinson. Digital by Dickinson, Bloomfield, N.J. Mastering: Bill Kipper, Master Disk, N.Y., N.Y. Contractor for musicians: Jack Kripl. A&R Coordinator: Richard Einhorn. Cover Designed by Candy Jernigan. Photographs by Eadweard Muybridge. All Music Published by Dunvagen Music (ASCAP) 1983. © 1983 Sony Music Entertainment Inc.